The blade cuts both ways: the home court advantage will make exporting to emerging markets much more difficult in the years ahead. The Social Channel will raise the bar because users in all markets will increasingly expect brands to relate to them and to solicit their input and advice. Brands will have to invest significantly in developing in-market social business teams that can build, nurture and leverage online relationships at a high level. This is Part Three of the Social Channel Trilogy. It will help CEOs and CMOs realize how the Social Channel will transform global markets. Brand stewards will learn how to use social business to defend against foreign firms and how to penetrate foreign markets. The trilogy reveals how companies can combat commoditization and develop new markets by tapping socially-powered innovation. The “global economy” of yore featured “advanced” industrialized economies that tweaked their product lines to sell in less developed markets, a reliable practice that boosted demand for these producers. Their products were more advanced than local offerings, which provided competitive advantage. “Emerging” countries were consumers of “advanced” countries. Today, however, “emerging” is as likely to denote a country whose plant production is on par or better than that of “advanced” countries, and they are exporting worldwide (Huawei is a quintessential example of a Chinese global leader). Online users everywhere openly discuss imported products’ advantages and shortcomings. Brands have historically been shoddy about doing research and design for local country user experience, and empowered users will be far less forgiving when they read frank accounts of disappointment online. Internet adoption/ecommerce—anyone with a web browser can hit your website, and online translation widgets are getting quite good for basic things; clients are regularly baffled by Asian buyers (“How did they find us; we’ve done no marketing?”). One third of Earth’s 7 billion population is online, and adoption is accelerating. Financial liberalization—it is increasingly seamless for people to pay for online purchases across borders. This enables global ecommerce, and adoption is accelerating. Social business—by finding each other online, researching and collaborating, groups of people with similar interests drastically cut the barriers to buying abroad. Let’s say I want a Chinese delivery bicycle, but I don’t know the market, all the vendors, etc. I can find a community of people, and we can use our collective networks to ferret out all the information we need; we can even try for a group buy. Smart industrialization/commoditization—Read Social Channel One to fully appreciate the imminent end of product feature differentiation. Due to online information, digital social collaboration, software-powered plants and smart distribution, commoditization is the rule for an increasing share of products. This state reflects the twilight of the Industrial Economy, which is fading in favor of the Knowledge Economy in which buying decisions are driven by online comments, ratings, discussions and friends/connections. Brands will be forced to engage online to influence buying decisions; product features will play a decreasing role. Globally, production is growing faster than consumption in many product categories, and emerging markets will add to the capacity. Meanwhile, “snap together” supply chains and multisourcing methodologies make firms more agile than ever. Due to these converging market forces, commoditization will continue to accelerate globally, and most firms will find it exceedingly difficult to compete on features of mass-produced products and mass-managed services. Firms that want to thrive will jump into the Social Channel early to work up the learning curve before their competitors realize what has hit them. Users’ expectations are relatively low now; next year, when they’ve experienced brands who try to fake “relationship” but expose their promotional goals, they will put up the bar. Similarly, when they experience people and firms that add value, their standards will go up. Firms that reach back end social business earlier will be beating competitors on the front end and the back end, so benefits accumulate. Firms that engage users collaboratively will confer “co-ownership” of the firm and its “products/services”; when people give important input that improves their outcomes (of using the product or service), they feel a strong sense of excitement and ownership. In this context, “marketing” cuts back on promoting and builds expertise in providing superior service across every interface the firm has with users. One of the most difficult Social Channel concepts for organizations to grasp is changing their orientation—away from product features and toward user experience, as detailed in Social Channel One. Product and product feature innovation happens relatively slowly, so the market opportunity is interacting with users (of your product/service) in digital social venues to help them create better and more meaningful outcomes when they use your product/service. When you think about it, aren’t user outcomes the point, anyway? 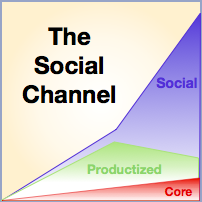 Social Channel Two details how to leverage the Social Channel to compete, step by step. Digital social venues have several features that enable this new era in creator/user collaboration that few executives appreciate because they haven’t spent enough time online to understand the potential. Knowledge is social. By sharing situations, beliefs, thoughts and idea, and getting feedback from a large group, everyone who is talking or listening is getting educated, very quickly. Digital social venues make this hyper-efficient; hundreds of people can participate, and people can drop in any time, guided to the conversation by specific keyword combinations (i.e. google). The people who know the most or make the most compelling statements get the most attention. The more specialized the situation, the easier it is to find the conversations (attention B2B). A couple dozen passionate people discussing specific situations (“use cases”) can create very rich and valuable content, which can be reused forever because it exists online. The passionate and knowledgeable minority drives the conversation, assisted by a 10-fold larger group and observed by a 100-fold even larger group. Everyone in the social venue is influenced by what happens. This is the network effect: by engaging with the few, you are impacting the many, even though most are observing silently. Users, when they are stating problems and sharing experiences and solutions, educate each other very quickly. They are the authority of the outcomes they desire. They know more than any company. Most firms must learn how to collaborate with empowered users; they are accustomed to relatively ignorant “consumers.” Empowered users are very different; it’s a collaborative relationship. You can create a strong sustainable home court advantage in your home markets by developing and leveraging your home market cultural knowledge, which will help you build better relationships with users than firms without local cultural knowledge. Our context in this use case is developing relationships and trust in the service of users who want better outcomes when using your product or service. The firm that provides the best outcomes wins. The Social Channel teaches that better outcomes arise from collaborating with users, so home cultural fluency will help you do that better, faster. This section will be especially relevant to companies in mature (erstwhile “advanced”) markets who face growing challenges from foreign manufacturing (and service) firms. Such firms often have lower cost inputs and can field better product features at significantly lower costs. That said, this section is equally useful for emerging markets that wish to defend against outside challengers. Social Channel Two lays out specific steps to pursue social business evolution in your front end and back end business processes, so this section adds to it with the goal of “defending” home markets against foreign firms. One of the key goals in front end innovation is identifying your firm’s most relevant users, noting where they prefer to discuss topics relevant to your products/services. While observing these users and interacting with them, you create models of their use cases for your products/services. A use case defines a limited range of situations in which they consider products like yours to help them achieve a desirable outcome. They evaluate options, choose one (yours, competitor’s), use it and obtain a result. For example, you sell forklifts for warehouses. You add the most value when users face certain situations. Define several use cases. With social business, you can ask clarifying questions in forums to get input very quickly to evolve your use cases. Now examine your use cases and apply cultural filters. For example, foreign competitors may offer longer battery life, more powerful motors, etc. They may offer superior machines for a lower cost. However, by focusing on users’ utility of the forklift, you discover that training and maintenance are higher because documentation is not as easy to understand, and communication with service organization is incrementally more difficult (even if they’ve contracted with a local service firm, that’s one step removed from the OEM). Foreign OEMs will find it challenging to enter such conversations because so much of detailed conversations about business challenges and solutions is between the lines; they are very difficult for people without deep cultural fluency. Some OEMs will try hiring social media firms to “communicate” on their behalf, but such efforts will only make them look worse: users don’t want to be promoted to, they want firms to relate to them, to listen and to communicate honestly. Hired hands don’t do that well. Neither do they have the domain knowledge (warehouse operations). Once you have established yourselves in several venues, you can start asking users for input and ideas into your service and training programs, for example. When you act on their ideas, they will turn into raving fans. As long as these conversations are taking place in public forums, you can quote from them on your website, etc., significantly leveraging the credibility you’ve developed in-venue. You will significantly increase the chance of success when you form a small social business team of people with explicit cultural experience, knowledge and awareness. Most natives are painfully unaware of culture unless they have had significant experience working and living abroad. In this case, you want natives (on your home country) with cross-cultural experience and relevant domain knowledge (warehouse operations). They need to write down (“codify”) the market cultural knowledge they identify. 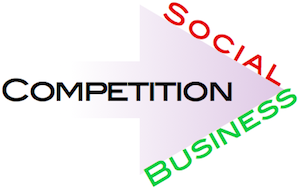 The social business team should develop explicit competencies that they can teach others to scale the effort. Since most employees in the home market are culturally fluent, increasing their awareness, so they can interact in social venues very effectively will be very straightforward when the team is identifying social business good practices and codifying them digitally. We call this a social business competency team. This use case employs many of the same principles as described in “Defending,” but the context and aim are different. Here, you want to use social business to engage users in “foreign” (to you) markets to expand your business across borders and cultures. No matter the market, people there are devoting their time and effort to get done the most important things in their lives. Even “social” activities like swapping sports statistics may seen inane, but people are spending the time to build their reputations, friends and networks. Their social position within the network. This is a very serious activity for humans and other primates. Therefore, your mission is to understand what they are trying to do and to help them in unique and memorable ways. Think of culture as a lens that can change the context of users’ activities. To succeed, you will have to build an explicit understanding of the cultural aspects of users’ behavior that are relevant to how they use your product/service. For example, culture affects how people work and use your product. Maybe the culture likes to drive forklifts faster, which affects usage and maintenance. The beautiful thing about social business is, you can begin your mission anywhere. You need not invest in in-market offices or teams right away, although you may want to for other reasons. Because we are constrained in this mission to online conversations, the first step is assessing online activity for use cases that are relevant to you. You will need to invest in hiring or contracting 1-3 people with in-market language skills (your scope team). They will also need a rigorous search and analysis approach to ensure that the assessment is accurate. Make sure you understand the difference between language proficiency and cultural fluency. They can overlap, but they are entirely different things. In some cases, depending on the country’s population and the users you want to engage, your home language might offer an initial proxy if it is widely spoken among the users in whom you’re interested. But you are always better off “going native” because you want to understand users’ context. If you establish that significant conversations are occurring in social venues in your desired market, develop formal use cases and apply cultural filters as described above. It can be useful to compare these to your home market’s use cases and cultural filters if you have done them. I recommend doing yours first because it will make your team aware of the process, goals and outcomes. But it isn’t absolutely necessary. You can begin interacting by asking the scope team to begin engaging in the venues you’ve been observing. As described above, you need to have them codify (write down) the market cultural knowledge they develop. You can grow your team of contractors or employees without even opening an office! By interacting in social venues, you can test your understanding of users’ goals and your use cases and refine them rapidly. As stated in “defending,” you will use this knowledge to scale the effort. I hope you can see that social business changes the economics of developing new markets for firms that understand how to do it right. Based on results, it will be to your advantage to spend time on the ground. Depending on users’ online habits, you will do best to flesh out your understanding (developed at low cost online) by getting across the table from them in-market. By understanding users, you can create use cases for your product/service before you invest in “bricks and mortar.” You can significantly increase your chance of success and reduce investment risk. Brands have bandied about the term “customer intimacy” for years, but they haven’t had to deliver in transparent social venues—until now. Users will increasingly demand it, as sure as they demanded websites of brands and firms by the early 2000s. In virtually every context, the better a brand listens to, responds to and helps people shows that it cares and wants relationship. The 20th century version was putting happy stock photos on the website accompanied by snappy copy. This is threadbare today because it is insincere, impersonal. When the brand couples listening and responding with transparency about its business, including shortcomings, intimacy goes through the roof—with users who want it. Culture is a critical element of intimacy, so it can serve as a barrier that firms can use to defend “home” markets, as defined in geographies in which they have significant native cultural knowledge. Firms without in-market cultural knowledge will struggle more to develop intimacy with users. Similarly, any firm can develop intimacy with users in any market, provided they do their homework, learn about users in that market, listen extensively and build cultural knowledge explicitly. They can build a team and scale the effort as they see business results. Social business can significantly reduce the time and cost of developing new markets. It can serve as a low cost “tip of the spear” since engagement is online, teams can be virtual and venues are online. It is best used in concert with on-the-ground engagement initiatives, but these can often be postponed pending social business results. The Social Channel can serve as an authentic bulwark against “foreign” competitors. I write “authentic” because, in this case, I’m proposing that firms use their native cultural fluency to add more value to their users; keeping “foreign” competitors out of markets as an end in itself destroys value for users. With multinationals, it can be difficult to ascertain what their “home country” is. The context here is economic, not political. Whereever they have significant native cultural fluency can be seen as a “home country.” Who’s Afraid of Huawei? suggests that political posturing against Huawei may be disingenuous; most “advanced” economy firms have their gear fabricated in China anyway. Executives and teams that lack in-depth experience developing relationships in digital social venues will likely miss the importance of intimacy and culture. This is quite understandable because firms have never had true relationships with users (erstwhile customers, clients) before. Prior to digital social venues, there has been no economic means of “connecting” with users.